Every wrestling referee needs a pair of wristbands to signal when awarding points. 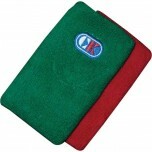 The red is for visiting team and green is used for home. Choose from the 3" or longer 5" wristband. 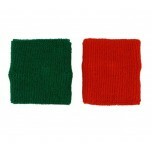 Red and Green Wrestling Referee Wristbands - 3"
To the new official this is an economy buy. I really do not like wrestling referee wristbands that are large. I am a small person so with the large wristbands I look like I wear arm sleeves. When it is warm the shorter bands allow me to cool off faster, and I can just loop onto my lanyard during breaks. Some of my fellow officials who are much taller than I, the larger bands look okay on them but not for me.